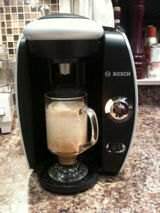 Keurig and Tassimo manufacture some of the most popular single-cup coffee makers, a.k.a., coffee pod machines. Using filtered and pressurized hot water delivery systems, these machines puncture and brew conveniently pre-packaged, single-serve cups of coffee, tea, or other drinks. 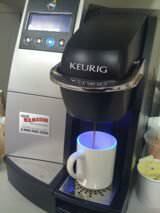 Keurig machines use a K-cup, which has coffee and (sometimes) a creamer inside it, and brews partially according to user input. Tassimo machines are a little different. They read a barcode on their single-serve T-discs that tells them how to brew each specific liquid; drinks that require milk usually call for two T-discs. Keurig machines use a "K-cup," which has coffee and (sometimes) a creamer inside it, and brews partially according to user input. Tassimo machines adjust brewing times, water temperature, and water measurements according to instructions they read from T-disc barcodes. For lattes and other milk-based drinks, the Tassimo uses two T-discs, one with milk and another with coffee. Some common K-cup brands include Green Mountain, Caribou, Donut Shop, Tully's, Twinings, Folgers, Celestial Seasonings, and Starbucks. Popular T-disc brands include Gevalia, Maxwell House, Tim Hortons, Twinings, and King of Joe. Both Keurig and Tassimo machines are capable of brewing single-cup servings of coffee, tea, hot chocolate, cider, and many other drinks. Both machines usually take 2-5 minutes to heat up and brew the contents of a cup. Tassimo machines adjust brewing times, water temperature, and water measurements according to the instructions they read from T-disc barcodes. For lattes and other milk-based drinks, the Tassimo uses two T-discs, one with milk and another with coffee, while Keurig drinks include the necessary creamer in a single K-cup. K-cups and T-discs are similar overall. Both aim for convenience and create single-cup servings of drinks. They differ most when it comes to milk-based drinks — Tassimos require two T-discs for those — and when it comes to user control — Keurigs allow users to adjust brewing settings, while Tassimos brew according to T-disc barcodes. K-cups (left) do not have barcodes like T-discs (right) do. The following video compares several types of espresso machines, including a Nespresso Latissima Plus, Tassimo T55, Keurig Rivo, CBTL, and Nespresso Vertuoline. Keurig and Tassimo have agreements with a variety of coffee and drink producers. Sometimes these agreements are exclusive, meaning Keurig and Tassimo do not have all of the same brands. 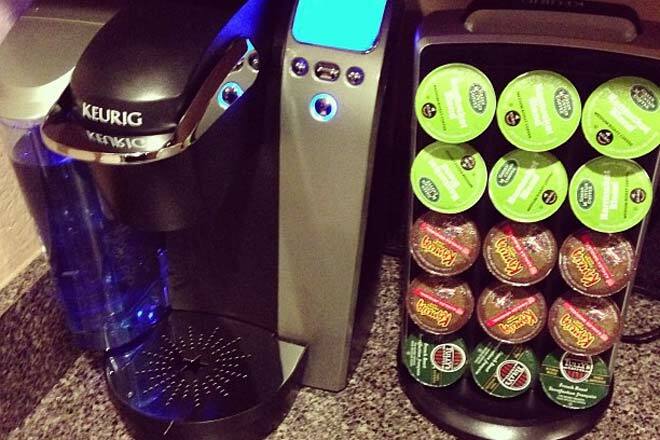 Keurig boasts that it has over 200 kinds of drinks. Some common K-cup brands include Green Mountain, Caribou, Donut Shop, Tully's, Twinings, Folgers, Celestial Seasonings, and Starbucks. Tassimo has a smaller range of drinks and connected brands. Popular T-disc brands include Gevalia, Maxwell House, Tim Hortons, Twinings, and King of Joe. Most Keurig and Tassimo machines cost a little over $100 to buy. This can seem like a good deal for those who desire the convenience of a single-serve coffee maker. However, the ongoing expense of K-cups or T-discs is worth considering. A 2013 article found that the cost per pound of K-cup coffee was often well over $50, whereas traditional bags of coffee are around $8-10/lb. T-discs are similarly expensive. Bulk-buying coffee pods or buying generic K-cup brands can help offset, but not eliminate, this extreme cost difference. For Keurig owners, at least, the high price of K-cups is not likely to change any time soon, as Keurig has recently moved to quash cheaper K-cup competition. Many report in reviews that Keurig and Tassimo machines last for 2-5 years. The durability of these machines has varied slightly by model, but both companies generally strive to include high quality parts in their coffee makers. Tassimo used to offer a longer, two-year warranty compared to Keurig's one-year warranty. However, Tassimo now offers only a 365-day warranty, except in the U.K., where 2-year warranties are required by law. How long either coffee maker lasts will also depend on how well the machine is maintained. Both should be cleaned regularly. For Keurig machines, that means cleaning brewer needles and the K-cup pack holders (for a how-to video, click here) — roughly a 10-minute process. The cleaning process for Tassimo machines varies somewhat by model but mainly relies on a special T-disc that runs the machines through a cleaning cycle; this process takes longer than Keurig's but is much more automated. 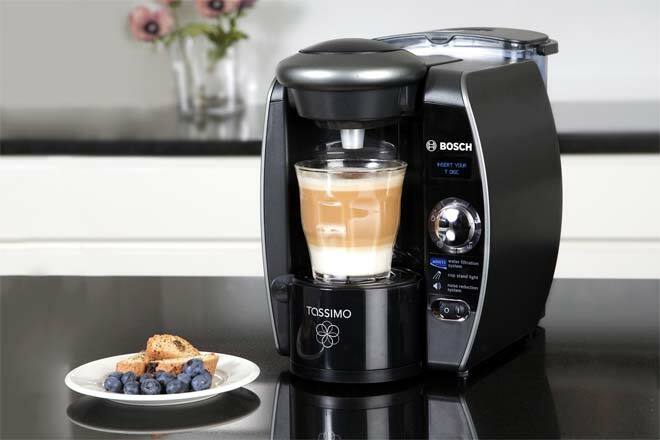 For videos on how to clean Tassimo machines, visit here. Green Mountain Coffee Roasters Inc., the owners of the Keurig brand, do not currently share sales figures. However, over four million Keurig coffee makers had been sold by the end of 2009. It has a larger market share than Tassimo, but a smaller global market share that Nespresso machines. Even so, single-serve coffee machines are not nearly as popular as automatic drip coffee machines or espresso machines. The Keurig K60/K65 is the most highly rated, bestselling Keurig machine on Amazon. Other popular and well-rated models include the K75, K40/K45, and the B145. Tassimo machines are less popular on Amazon, but among them the T20 and the T55 systems are the most highly rated. Many buy Tassimo machines directly from the manufacturer. As of January 2015, Tassimo machines, such as the T47 and T55, tend to be rated between 4 and 5 stars, with newer models often leaning closer to 5-star ratings. Keurig machines, including the K45 and K130/B130, often receive 4-star ratings, suggesting that Bosch's Tassimo machines have perhaps pulled ahead of Keurig's in recent months. The Amazon best sellers list for single-serve brewers is informative. Seven of the top 20 coffee makers in that list are Keurig machines. The plastic cups used by Keurig K-cups and Tassimo T-discs cannot be reused or recycled in most all cases in the U.S., meaning they end up in landfills. This makes Keurig's and Tassimo's' machines and business models much less environmentally friendly than many other drink-brewing methods. Reusable cups and discs do exist for personal coffee-making but depend on manual refills of personal coffees and creamers. None of the branded coffees or other drinks come in a reusable container. I've had both and Tassimo wins hands down. I have both tassimo and keurig..and find tassimo has far better real taste..heats better and has so many mire types of style coffees. teas chocolate to choose from..plus longer warranty.